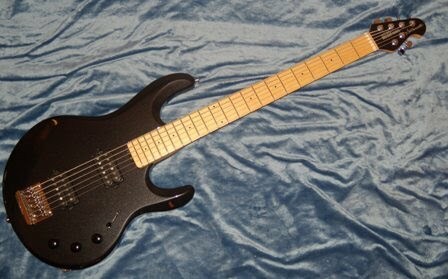 Here is a bass/guitar that never really worked out for me. It is an Ernie Ball Musicman Silhouette bass. There are not very many of these around. Believing the “Bass” in the name is probably where I went wrong. It is really a 30-inch scale baritone guitar. Generally they are sold as a baritone guitar tuned A to A (0.013 to 0.072), or as a bass tuned E to E (.010 to 0.090). There is no difference between the two other than the strings and set-up. These are fine instruments that are made by nice folks in San Luis Obispo, California. This one has a poplar body that was sprayed with the metallic Sapphire Black finish, which is really more of a dark gray. The build quality and finish are first rate. The 22-fret necks are only available with a maple fretboard, and have a gunstock oil and wax finish. 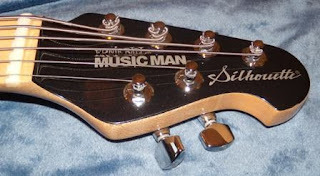 As with all Musicman guitars, it is fitted to the body well, with no unseemly gaps. The nut is compensated to proved better intonation. The truss rod can be easily adjusted via an exposed wheel at the heel. The chrome hardware is good quality. 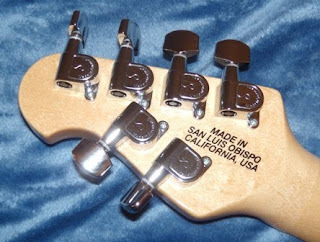 The non-locking tuners are made by Schaller, and the bridge has Schaller roller saddles. Silo basses string through the body, which always makes me happy. 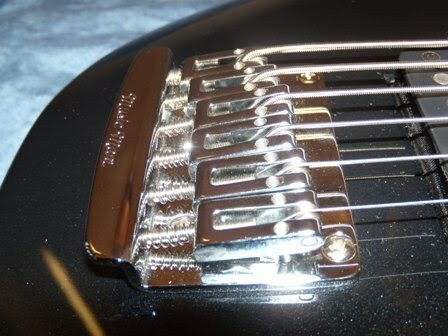 I like the feel and sustain of guitars that have this feature. The electronics are quiet, and the DiMarzio custom split humbuckers are killer. There is a 5-way position switch and a 2-way rotary series/parallel selector (in addition to the normal volume and tone pots) so you can get a nice variety of tones from it. Saving the best for last, this instrument is amazingly light, coming in at around 6 pounds 11 ounces. w00t! So far, everything sounds good, right? Unfortunatley, the deal-breaker for me on this guitar was that the nut is fairly narrow (1.75 inches) so the strings are awfully close together for fat-fingered me. Meaning that I had a lot of trouble playing this as a bass. 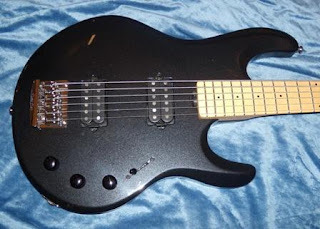 And, I am not a super guitar player, so I kind of came up short when trying to approach it as a baritone guitar. Would you be interested in selling it ? Let me know I'm close to LA.